Hanbok is the traditional attire of the Korean people. Worn daily up until just 100 years ago, hanbok comes in various shapes and colors, reflecting the culture and lifestyle of the its time. Nowadays, it is only worn on special occasions or anniversaries. It is a formal wear and many Koreans keep a hanbok for such occasions. While the traditional hanbok was beautiful in its own right, the design has changed slowly but surely over the generations. The core of hanbok is its graceful shape and vibrant colors, which have had a major impact on the modern fashion industry. It is hard to think of hanbok as everyday wear but it is slowly being revolutionized through the changing of fabrics, colors and features, reflecting the latest trend. 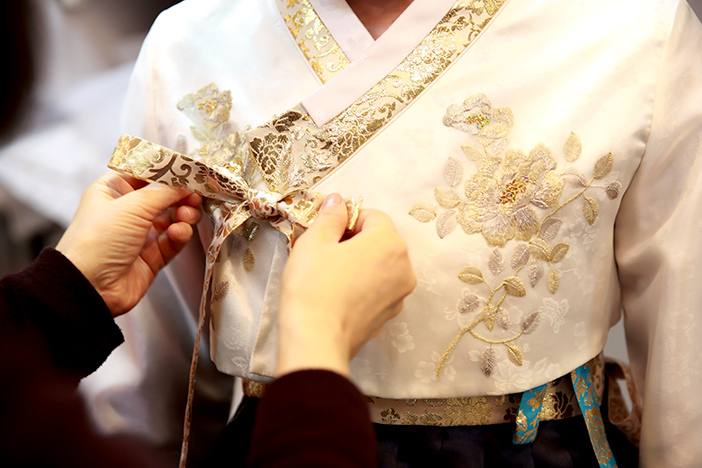 Many aspiring hanbok designers have altered hanbok for everyday wear with traditional elements at the base of the garment but having a distinct modern feel. The unique lines of hanbok appear at their greatest when the wearer is in motion. Hanbok is creative and expressive in its design. Another special feature about hanbok is the shape, having a slim top and wide bottom, similar to a bell. The jacket should be tight and fitted while the skirt is. The tightly fitting jacket attractively reflects the shape of the upper body. The wide and flexible skirt flatter the wearer’s gracefulness by hiding the movements of the lower body, so the wearer appears to be floating on air. Hanbok fabric is colored using natural dyes. 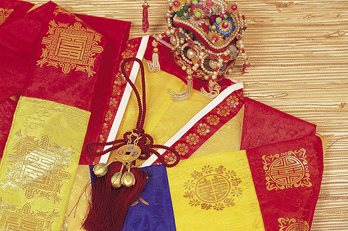 The colors of nature are imbued in the cloth, giving hanbok a depth and richness not found from artificial dyes. A full set of hanbok for men consists of a vest, jeogori (top jacket), and a pair of pants while women's include a jeogori, undershirt, skirt, and a pair of pantaloons. For modern Koreans, hanbok are the formal clothing worn during Korean holidays or on special occasions. Children wear hanbok on their first birthday and adults wear it for their wedding ceremony or major events within the family, including funerals. Although hanbok have become the ritual dress of choice worn only on traditional holidays, Koreans' love for hanbok is tremendous. The number of people wearing stylish hanbok modified to suit as an everyday wear continues to increase, and many enjoy outing in hanbok by renting one from hanbok rental shops. This page was last updated on March 14, 2019, and therefore information may differ from what is presented here.